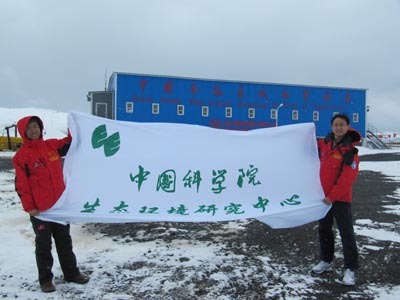 Dr. Li Yingming, team member of the State Key Laboratory of Environmental Chemistry and Ecotoxicology (SKLECE) of RCEES, participated in the 27th Chinese Antarctic Scientific Expedition and arrived at China Great Wall Station in Antarctica on Nov. 29, 2010. He will perform two-month period of polar investigation titled “Bioaccumulation of Persistent Organic Pollutants in Antarctic Region”. Based on last year’s Antarctic expedition results, this time their research will focus on the study of the bioconcentration and transportation mechanism of persistent organic pollutants (POPs) by analyzing air, seawater, plankton, algae, Antarctic krill and shellfish samples from Antarctic region. This long term study and observations will not only resulted in a very useful basic data accumulation regarding to polar eco-environmental variations, but also contribute to our understanding the long distance transport mechanism of POPs, which is crucial to develop China’s priority-controlled POPs list. Professor Jiang Guibin and Zhang Qinhua joined the 26th China’s Antarctic Expedition in 2009, and initiated POPs research program in Antarctic region. Hereafter, the State Key Laboratory of Environmental Chemistry and Ecotoxicology will dispatch research staffs in annual expedition to sustain the Antarctic POPs research in the long term.